Ekatara Veena is a single stringed musical instrument used by Hindu saints and devotees especially of the Bhakti tradition. 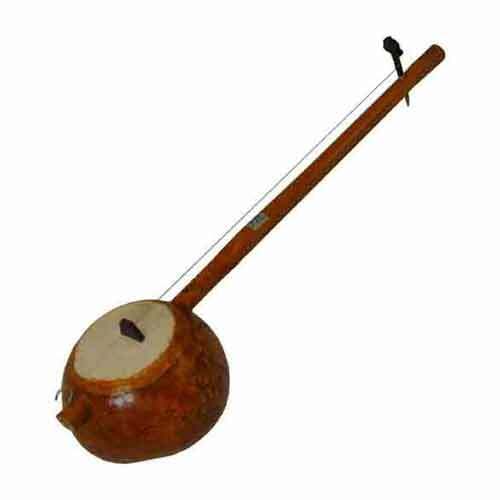 It is a musical instrument widely used by Bauls and Warkaris of Maharashtra. In the history of the evolution of Hindu musical instruments, the ekatara is without doubt, the first among the stringed instruments. Its forerunner was perhaps the bow. In India, the antiquity of the bow dates back at least ten thousand years, as it appears in the Mesolithic paintings in the caves and rock shelters of the Narmada valley in Central India. It is inferred that the people of the Indus Valley Civilization probably also used a stringed instrument because there is a letter in the Indus script which looks like the shaft of a stringed instrument. It is further argued that considering the flourishing trading contacts between India and West Asia in the third millennium, it is highly likely that the Harappans too had stringed instruments. The Veena was used by the saints of the Vedic period for singing Sama Veda. Ekantantri Veena, the single stringed lute, is the most important of all veenas. It is extremely simple in construction. It consists of a short wooden rod of the khair wood that is quite tough and long lasting. Khair wood is known as Acacia Catecu. The wooden rod should be of a round cross-section and smooth without any knot or any other flaw. From seventeen fingers from one end of the wooden rod of Ekatara veena musical instrument is fixed a round dried pumpkin. The pumpkin has a diameter of sixty fingers. The other end known as kakubha and metal plate of the shape of a tortoise is fitted here. The metal string is tightly attached to both these ends. At one end of the string, a small bamboo piece known as jiva or jawari is fixed between the string and the metal plate. The kona, plectrum, also of bamboo, is used for playing the instrument. This simple vina is widely used in India especially by wandering monks and in folk performances. The Warkari saints (followers of Sant Tukaram and Sant Jnaneshwar) carry the Ekatara. Notes taken from – Deva, Chaitanya, 2000. Musical Instruments of India: Their History and Development. New Delhi: Mushiram Manoharlal Publishers. Encyclopedia of Hinduism Volume IV – India Heritage Research Foundation – Page no 23 – 24.